SVG! SVG! Crisp on an y displa y L ess HTTP requests to handle Easily scalable for responsiv e Small filesize if y ou design for performance Easy to animate Easy to mak e accessible F un! Positioning in CSS got y ou down? Positioning in CSS got y ou down? e i t h e r .
D e s i g n . .
Like legos . Like legos . Use it FOR the la y out preserveAspectRatio="none"
Th at whole SVG is 2KB! Th at whole SVG is 2KB! Wh at's h appening? Wh at's h appening? Entire file size: 6KB! Entire file size: 6KB! Lo ader s! Lo ader s! i mage s smal l e r ! By (go follow him) Sha w 38k b => 16k b! 38k b => 16k b!
" t i t l e "
" s v g "
" p r e s e n t a t i o n "
" h t t p : / / w w w . w 3 . o r g / 2 0 0 0 / s v g "
" i c o n "
" M e n u "
h a m b u r g e r "
" 1 . 0 "
" e v e n o d d "
s t y l e . .
e v e r y t h i n g . .
" a n i m a t e B a l l "
" ! r u n n i n g "
s t a r t 1 ) } ` . j o i n ( "
" t u r b "
" t u r b w a v e "
" f r a c t a l N o i s e "
" t u r b u l e n c e _ 3 "
" S o u r c e G r a p h i c "
} Y ou already know this! The dash 's offset is an animatable property! b a l l o o n T l . t o ( "
" f o r m a r e a "
" c r e a t e S m C i r c l e s "
" c r e a t e B i g C i r c l e s "
" a n i m a t i o n "
" p a u s e A n i m "
" a p p "
" c o o r d i n a t e s "
" m a s k "
" u s e r S p a c e O n U s e "
" 1 0 0 % "
c h e c k e r ) "
m a s k ) "
All this, and we didn't e ven All this, and we didn't e ven get to dat a vis! get to dat a vis! Th ank y ou! Th ank y ou! 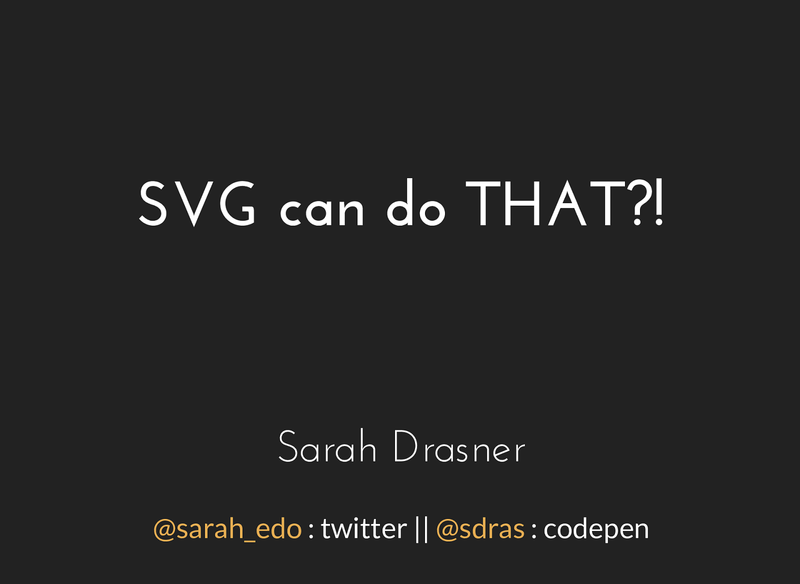 View SVG Can Do That?! on Notist. SVGs, with their potential for high-quality and performant graphics, have myriad uses on the web. By now, a lot of developers are aware of their practical uses, such as small and accessible icons, or illustrations. In this session, though, Sarah will go beyond typical use cases. She’ll cover a few practical things like styling SVG icons like typography, and then dive into the creative wilds of this graphic format built with math. She’ll make it respond to physics, make it bounce and snap, stack it like legos for responsive, and make it interactive with front-end frameworks like Vue.js and React. In this session Sarah will push the boundaries of what’s possible while also thinking about cross-browser stability, and you’ll come out of it with a whole new world of tools in your front-end developer toolbox.